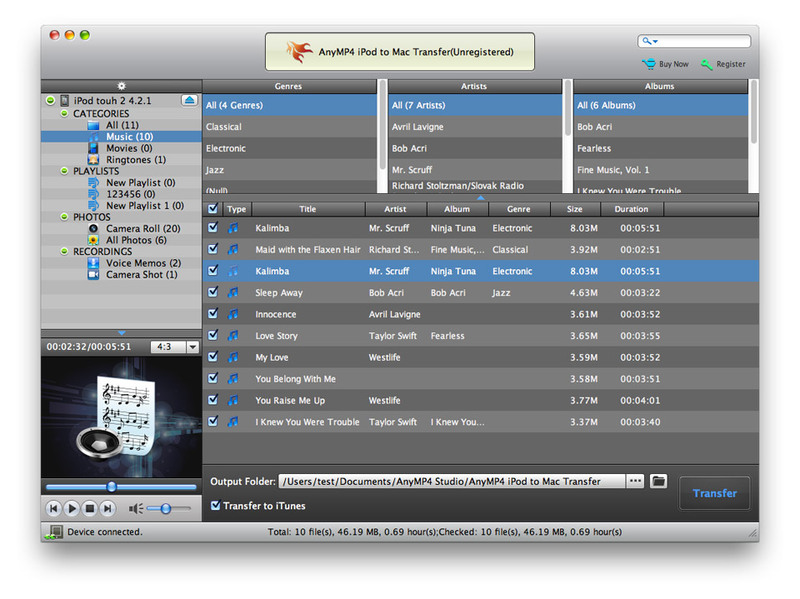 AnyMP4 iPod to Mac Transfer is the professional transferring software for iPod users. It can help iPod users transfer music, movies, ringtone, PDF, audio books, camera roll, picture, voice memos, camera shot, etc. files to Mac. Besides, it can syn iPod files to iTunes for later use. This software supports any version of iPod, iPhone and iPad devices. And it supports the latest iOS6. AnyMP4 iPod to Mac Transfer can help users backup almost all iPod files (music/movie/Photos/Camera Roll/Voice memos/Camera shot, etc.) to Mac. And it supports to backup iPod files to Mac for later use without any limitation. This iPod to Mac Transfer owns a built-in player, which can help users preview the video, music and photo effect. This software is highly compatible with any version of Apple devices like iPod, iPhone and iPad. And it supports the latest iOS 6. The &quot;Track Filter&quot; and &quot;Search&quot; function can help you make your find files easily. This iPod to Mac Transfer provides users with a user-friendly interface, and users can conveniently find the desired files and transfer files to Mac. Cucusoft iPod Movie/Video Converter 5.16 by Cucusoft Inc.
Cucusoft iPod Movie/Video Converter is the easiest-to-use iPod video converter. Cucusoft iPod Video Converter + DVD to iPod Suite 6.2.5.16 by Cucusoft Inc.
Cucusoft iPod Video Converter Suite is an all-in-one iPod video solution. Manage iPod files by transferring videos, audios and photos between iPod and PC. Copy DVD to DVD disc/DVD folder/ISO files, burn DVD folder/ISO file to DVD disc. WinAVI Video Converter 10.1 by ZJMedia Digital Technology Ltd.
Cucusoft iPad/iPhone/iPod to Computer Transfer 7.7.5 by Cucusoft, Inc.